We are all very aware of Ireland’s current financial crisis, as are we aware of similar situations in Greece and Spain. A stark contrast between the crisis countries however is how the people are reacting to government ‘solutions’. While in Greece there is mass rioting and unfortunately violence occurring on the streets, the Irish people are being criticized for doing almost nothing in the face of continuous cuts and job losses. We are criticized for our laid back manner regarding the matter and our refusal to take a hard stance against our government. Last Saturday however we showed that the recession has not been swept completely under that table and we do have some fight within us. We may not take to the streets in masses outside government buildings and we certainly are not causing destruction on the streets, but we are looking after our own. For me Ireland is a country with a very strong sense of community. We have gone through such hardships before and worse, but we have never left these troublesome times truly defeat us. In reality, we know that we cannot stand up against the government and we certainly cannot stand up against the goliaths that are Angela Merkel and Nicolas Sarkozy who will get the last say in matters anyway. But we can unite on a different front. I bet if you go to any town, village, city or council estate in Ireland you will find people working together against the recession in a different way. They mind each other’s children, share food, lend money without ever having the intention of receiving it back. They may not be able to afford to go out to a nice restaurant but instead bring the festivities into their home. They provide a shoulder to cry on when a friend has lost their job, car or house. For me this is what is important, the sense of community. The recession will be in place for a number of years yet and there is very little we can do about it only make the lives of people around us a little easier to bear. We all love an underdog story and currently Ireland seems currently to be in the midst of them all. It is news stories like that of the Vita Cortex workers which warm my heart and make me see that all is not lost within my home country. 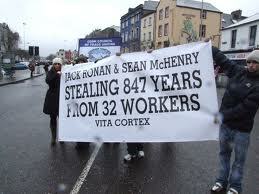 I wish the workers at Vita Cortex all the best and remember good will always triumph!